I sometimes feel like we don’t give Fimo clay enough credit as a design material. It’s not cheap, admittedly. And it takes a while to get good at working with it. But from jewelry to simple decorative forms, to the creation of cast-able parts, it’s got a lot of things going for it, like being used to create solid and open forms. It’s almost as versatile as ceramic. More, unlike ceramic, it can be cooked to hardness at 275° F (135° C). I’m not very good at working with it, but a colleague of mine is, and she’s good at teaching some of these skills to other students. I’ve picked up a few things from her, which allowed me to experiment with a few pieces this morning. First, why the experiment in the first place? Well, I’m creating one of the key tools of my Druidic work, moving on from the Bardic grade — namely, the Serpent’s Egg. Frankly, I’m not yet sure what the egg does, aside from be a symbolic representation of the alchemical work I’ve done so far. A lot of this has involved processing plants in various ways — changing them from raw plant matter to dust through a process called maceration, extracting essential oils from the plant dust, and then recombining the plant material with the essential oils through fiery processes called calcination and cohobation. It’s all very mysterious. The Serpent’s Egg eventually contains some bits of all this work. Which means that it has to be a container. Which means that it has to hold both liquid and solid. And it’s meant to be worn at times. So it’s kind of like jewelry, and kind of like an egg, and how should this be made, anyway? 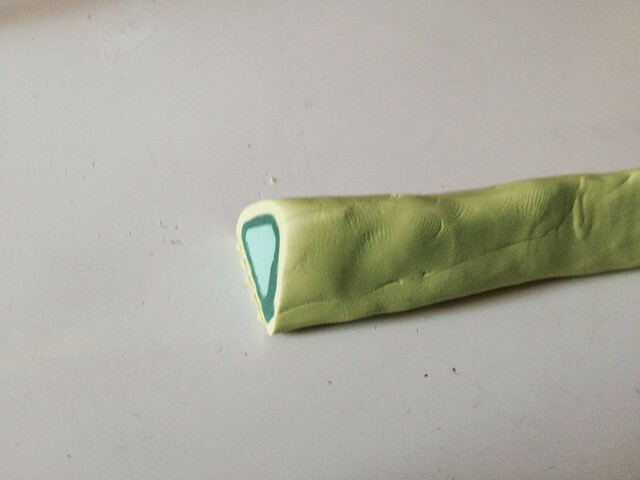 I wish I’d taken more photographs of the process of rolling out the clay, and then shaping this tube of colored clay, called a cane, from three layers of different colored green Fimo clay. I didn’t have an extruder; this was done mostly by hand with a couple of straight edges. So my triangles were not as regular as I imagined they would be. Still, I’m enough of a D&D player to know that there are D4s (tetrahedrons), D8s (octahedrons) and D20s (icosahedrons) which are made up of triangles, and that any of these shapes could serve as a rough form for the Serpent’s Egg. So, I cut up my cane into numerous slices, and then began assembling them into containers with lids, each of about the right size to serve as a Serpent’s Egg. And because I’m a designer, and I believe in concurrent sigilization, I made three containers rather than just one to see how it turned out. I’m enough of a magician to want to avoid giving you a complete picture of what the work looks like (I’m also enough of a designer that I know that these first few are not likely to turn out well). 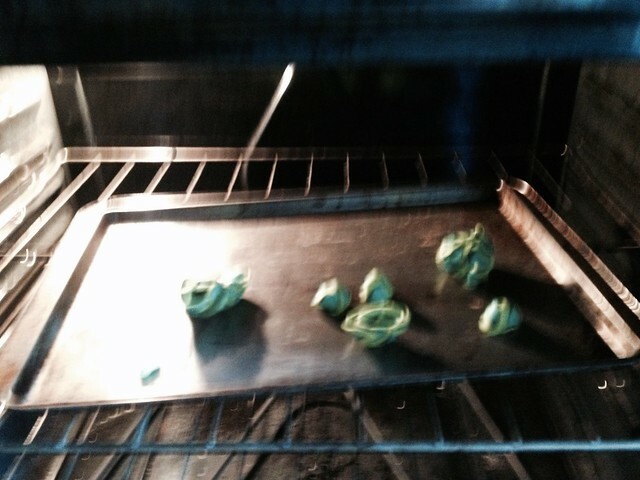 So you don’t have a great photo of the containers in the oven, although you can imagine. The one on the left is shaped (and colored) remarkably like a weird super-hot ghost pepper from the Amazon, for example. Why not show the work? Well, for one, you might decide to critique it more heavily than I might wish, and that would make me doubt the capacity of my magic — not something I’m interested in. For another, there’s genuine benefit in focusing on the material rather than on the thing being made, which is what I’m trying to do here. I think, in the design thinking community, we tend to focus on the product a bit too much at times; we forget that there’s benefit in teaching children (and adults for that matter) about the properties of materials — whether they be wood or glue, paper or fimo clay, plastic or ceramic. 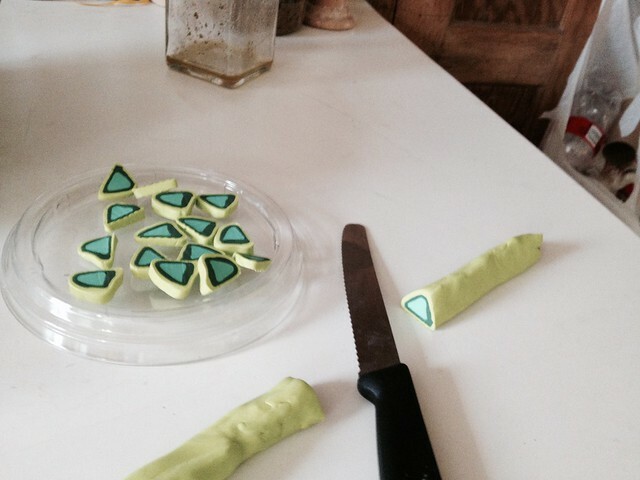 Fimo clay, for example, must go through a chemical change. I don’t know what that chemical change is, because I’m not a chemist. But I know enough about chemistry to know that something inanimate like clay does not go from relatively soft and pliable to something relatively hard and rigid without a chemical change (Biology has other processes for that). 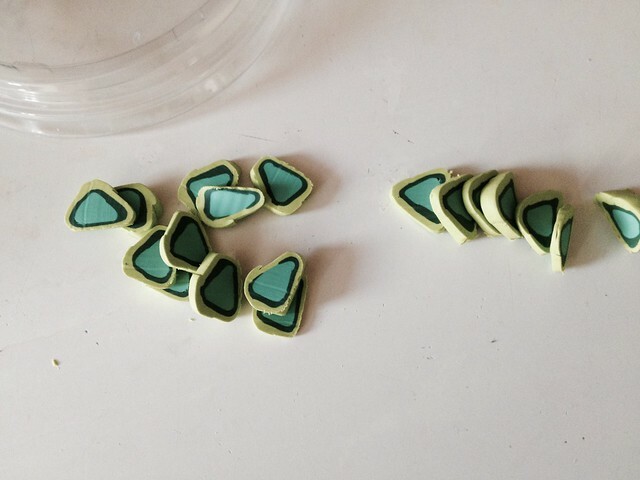 There’s another process, though, which Fimo clay teaches that’s important. And that’s the warping of the clay as it cools. I fully expect that two of my three containers and lids — although they fit before I put them in the oven — probably won’t fit together after they come out of the oven. This is a tricky substance to work with. But the principle of warping is an important one for people expecting to work with materials. With wet heat, you can tie a strip of oak into a knot. With dry heat, you can make pliable Fimo into something hard, or vitrify soft clay into stoneware. Heat, and its effect on materials, is something that schools don’t teach with hands-on activities. And yet Fimo clay, with its low-firing temperature and its short heating times (often less than 15 minutes, rarely more than 30 minutes), is a great way of exposing even very young children to the idea that heat is not only a way to cook, but also a way to transform materials from one phase state to another. That strikes me as something that children somehow may guess at intuitively, but don’t really understand until they see it for themselves. And this means that I have to figure out how to teach this skill, along with many others, to my students next year. 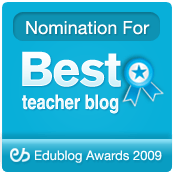 Previous Tai Chi Y4D97: what’s worth noticing?